Woke up at 1AM from my dog pile by the wood stove to dogs barking their heads off. It was a full moon so it could be anything from a coyote trotting up the far hillside to a late-night car driving too slow down the icy road. I told them to come back to bed but they wouldn't quit. 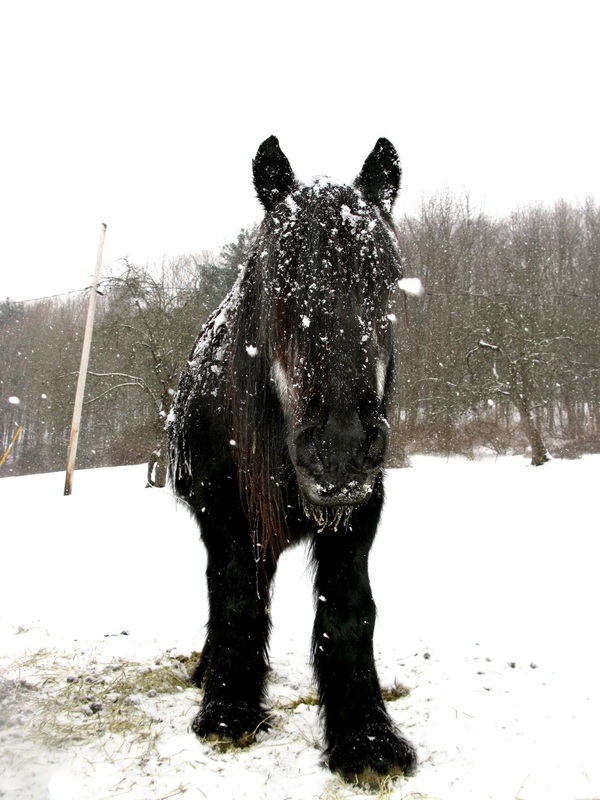 So I looked out the window with them (slightly grateful, as the stove needed feeding) and saw a half ton of black draft pony standing in my driveway. Merlin was eating hay out of the back of the truck. Oh, fun. It took a little bit of grain to lead Merlin back inside his fence. Mabel watched the whole thing. She won't dare step or jump over a barrier. She has a gnarly scar on her hind leg that my farrier thinks came from a tangle with bad fencing when she was younger, maybe back in Ohio where she originated from. The woman I bought her from said she didn't know what it was about either. When horses go through several states and owners their stories turn more into mythology than anything else. Anyway, Mabel didn't leave the pasture. And Merlin walked back in past the gate he knocked down to walk through. SO at 1AM in the 4° weather I repaired it. Threw them a bale. And then was WIDE AWAKE so I sat by the fire and watched a documentary. I so enjoy these guys who create beautiful, free, seasonal adventure documentaries around the world. Watching them winter camp through a blizzard made me feel a lot better about my few minutes of pony-induced inconvenience. I watched for a while while sipping hot water spiked with some lemon juice to warm me up inside without any sugar or caffeine. I fell asleep a while later. The horses stayed put. I am feeling less afraid and more determined about the farm's ongoing precarious state. Worrying does nothing. Action does. I sat down and did all the math. To get through this month—the last 8 days— which means making a mortgage payment postmarked by the 28th and mailing in my health insurance premium (I really want to keep having health insurance) I need to earn a reasonable amount every day for the next 7 days. About $194. Which for me that's as simple as one meat share, 2 logos, or several pet illustrations or soap orders. I have already made the utility/internet bills. I figured out the dental work. I had the truck repaired. And now I am wearing blinders on to get this goal met so the farm stays out of danger's maw and I get one step closer to spring - roof over my head and health insurance secured. So I am going to try like hell to make the sales and get through this, one day at a time, and keep going as I have for the past 9 years on this farm. May marks the 9th year here, can you believe that?! I need to believe in the statistics of past struggles and making it through. I need to only focus on the work, on being optimistic, and that something/somehow will lead towards a solvent spring.